↑ Executive Council, Chairman. "NMML". Retrieved 21 August 2016. ↑ History Jawaharlal Nehru Memorial Fund, Official website. ↑ ୪.୦ ୪.୧ ୪.୨ "Steeped in history, a three-statue salute to erstwhile princely states". Hindustan Times. April 13, 2013. Retrieved September 24, 2013. ↑ "Nehru Planetarium". Press Information Bureau, Govt. of India. October 2001. 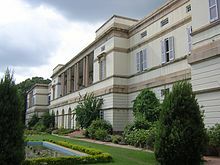 ↑ "Nehru Planetarium ready to receive the Queen's Baton". The Hindu. September 30, 2010. ↑ "Indian cavalry's victorious trysts with India's history". Asian Age. December 6, 2011. ↑ "King's resort in the wild". Hindustan Times. New Delhi. August 4, 2012.